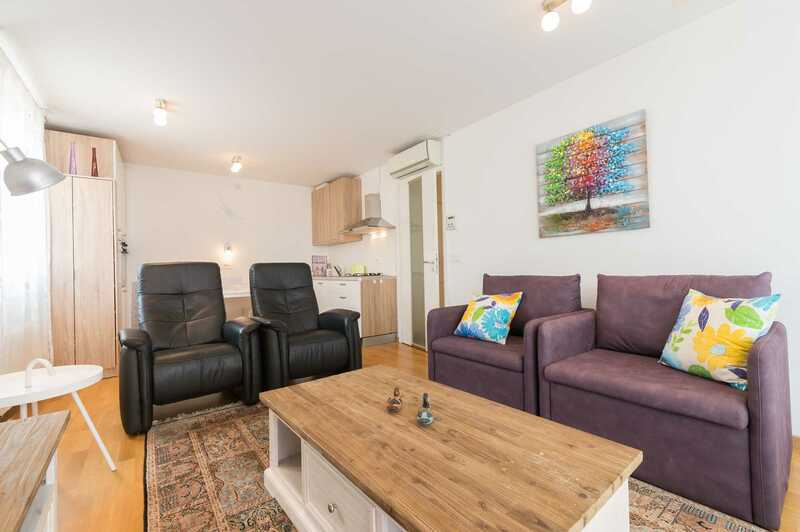 This lovely 1-bedroom apartment is located in Trnovo, an attractive neighborhood just beyond Ljubljana’s historic center. 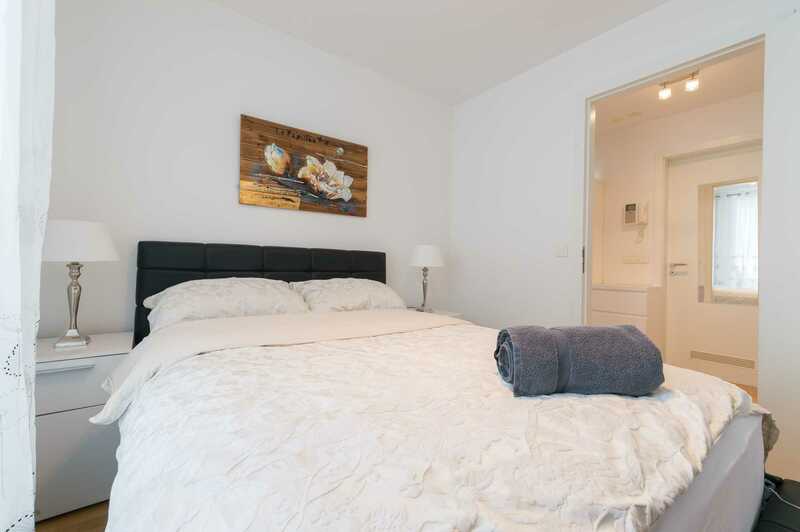 The location is very convenient and the apartment has a great advantage of its very own parking space. Children (and adults!) 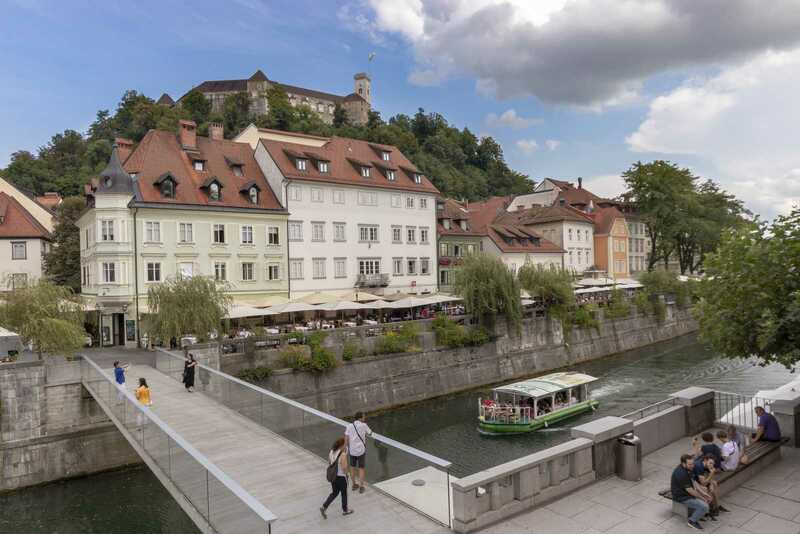 have plenty of options for enjoying the outdoor green spaces and it is still only fifteen minute’s walk to the Shoemaker’s Bridge, the center of the Old Town Ljubljana. My family would enjoy staying here and I think yours would, too. Perfect location for city trip. 15 minute walk into center or short bike ride with the city bike station nearby. Brilliant apartment, stylish decorated with a beautiful spa, swimming pool and sports facilities. And of course free parking in front of the apartment. 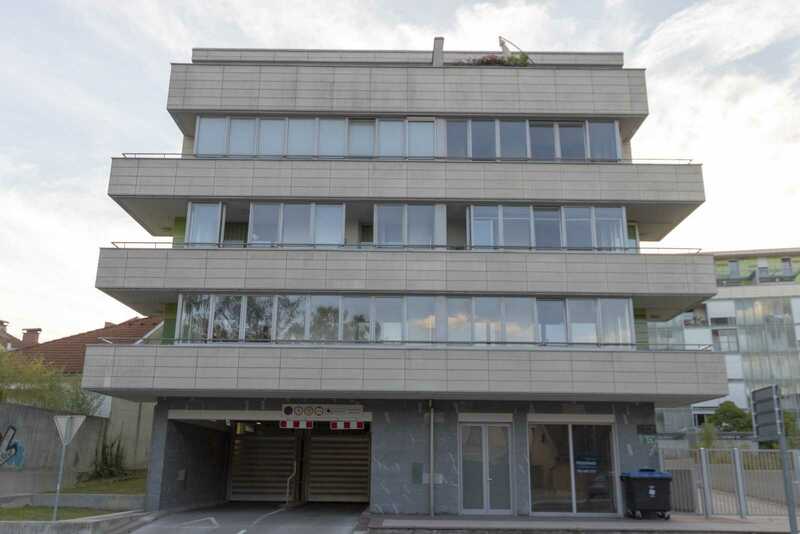 This 1st floor, Ljubljana accommodation with private parking is just ten minutes’ walk from Ljubljana Old Town and ideal for a business visit or vacation. The interior decor blends homeliness with classic modernity. It has an open-plan living area with two leather recliners plus two quality, sofa beds for extra sleeping space. The kitchen-diner, fully equipped with ample storage in the fitted cupboards, an extractor hood and oven, is spacious and bright. There’s a comfortable French, queen-sized bed in the independent bedroom, a bathroom with a full-size bath and a patio for outdoor dining. We call this our “Mini Duplex” though in reality this 1-bedroom apartment is anything but “mini”. Up to 4 adults can be comfortably accommodated here, offering an affordable alternative to hotel rooms for two visiting couples, as well as the benefit of privacy, space, a full kitchen and the chance to live amidst the locals during your stay. 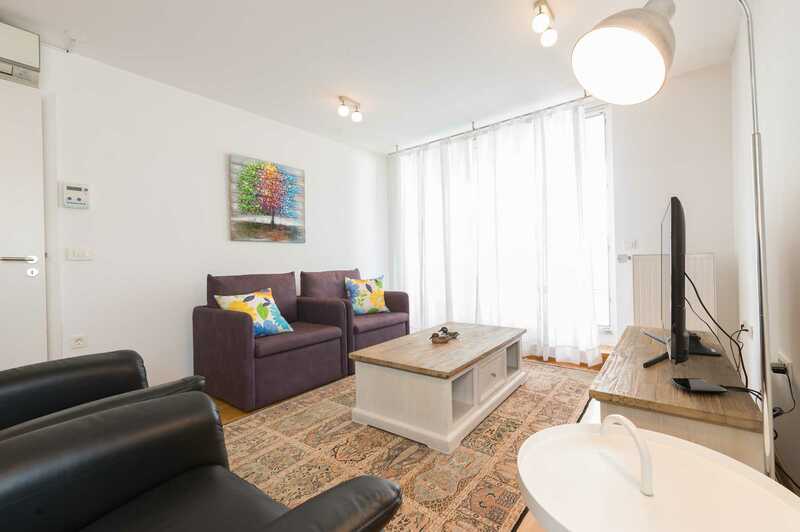 Whether you’re coming to the city on your own or with friends, the apartment provides ample space for one couple, a family with two or three children, or two couples visiting the city together. You may also be interested to hear that within this same building we have another two vacation apartments available for rent, making this a great choice for larger groups of visitors too. A comfortable and spacious, open-plan living area offers home from home comforts with two reclining leather chairs and a flat-screen TV with 120 channels. Ideal for relaxing after a long day of business meetings or sightseeing. Two top quality single sofa-beds offer a versatile seating arrangement which can be used to maximize the Ljubljana accommodation’s sleeping space to four. The warm tone of the wood flooring accentuates the neutral decor as does the floor rug and colorful wall art. Double patio doors not only make it bright and airy, but give access to the private terrace. 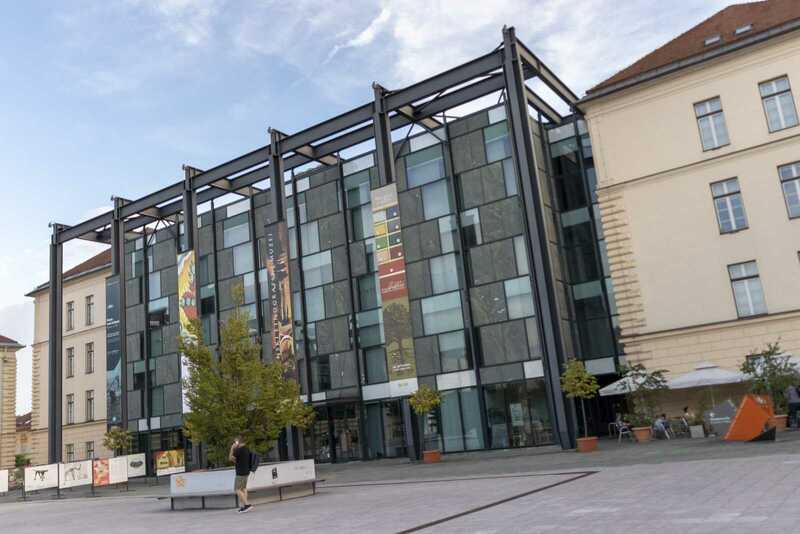 If you’d like to know more about staying in the Ljubljana accommodation, contact us here. 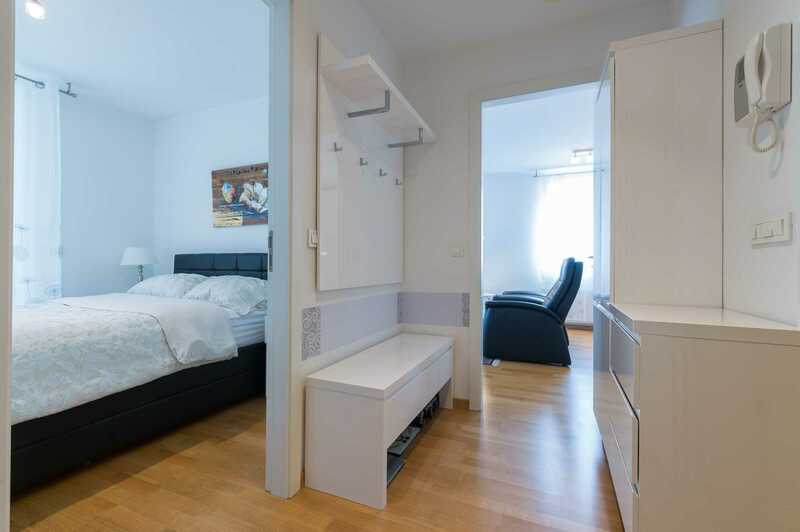 The simple color scheme of the Ljubljana accommodation’s independent bedroom promises a restful night’s sleep. Watch the wall-mounted TV while resting in the French-style queen-sized bed or wake up and wander out through the patio doors onto the terrace to enjoy your morning coffee there. If you’d like to spend your vacation nights here – contact us! 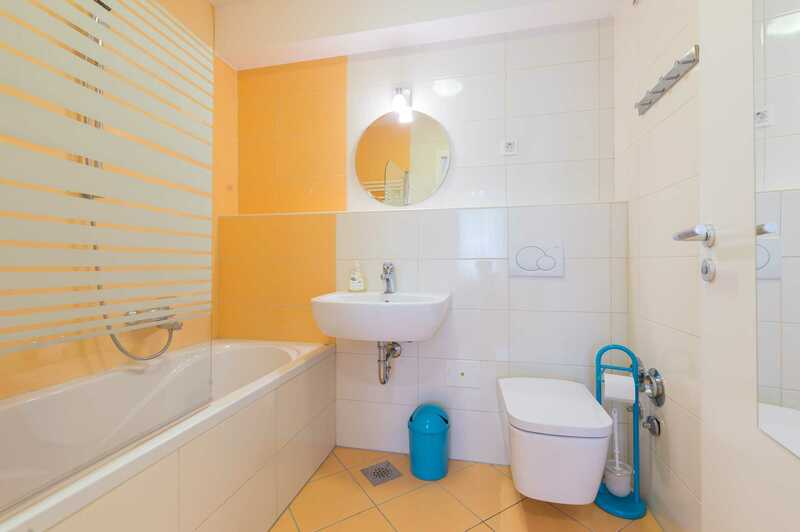 The Ljubljana accommodation has a very well-appointed bathroom with high quality fixtures and fittings. You can take a long soak in the full-size bath or shower if you prefer. There’s a washing machine installed in the bathroom for which all detergent is supplied, as are fresh towels. 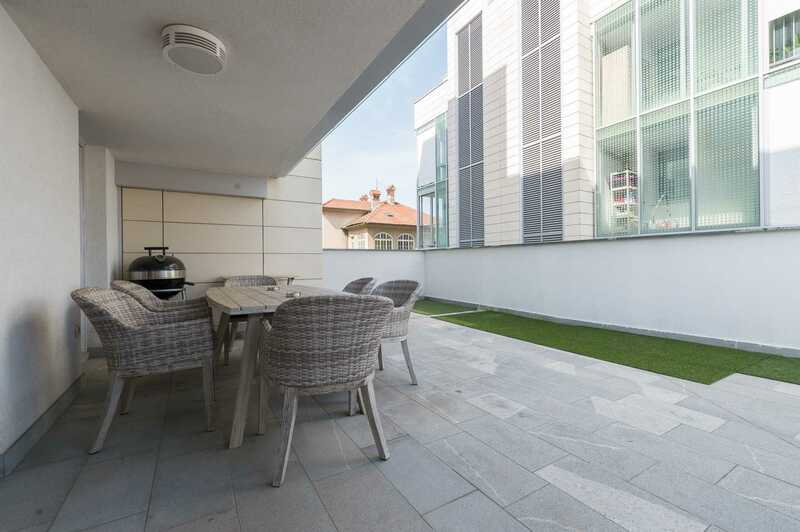 The Ljubljana accommodation has its own private patio terrace with a table and six chairs. It’s the ideal spot to light up the grill and have friends or work colleagues round for a barbecue. Fancy having a barbecue here? Then get in touch! 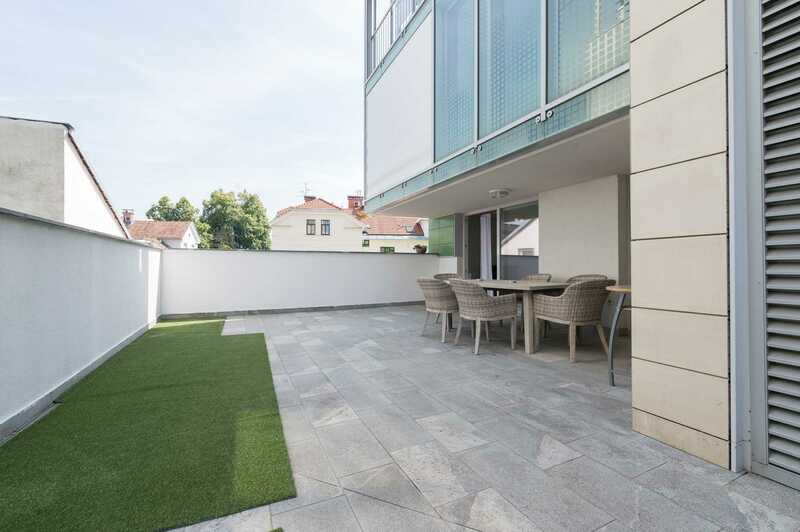 This superb accommodation in Ljubljana is very centrally located with excellent access to public transport services. The Central Stations for both bus and train are just a seven minute walk away. Although it is in a residential area, both the Situla Business Building and the BTC shopping center are within easy reach. 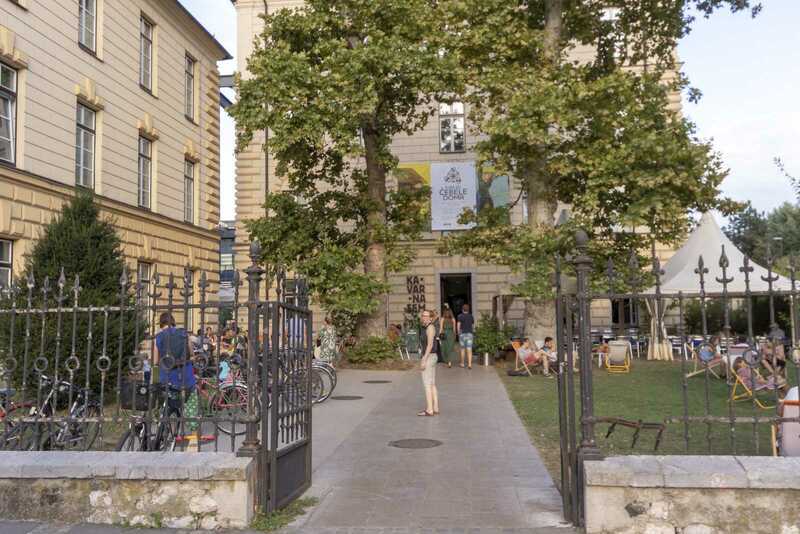 It’s a short stroll to Ljubljana Old Town if you’re interested in exploring or visiting some of the cultural sights such as the Slovene Ethnographic Museum or the Museum of Contemporary Art. For something different, and if you like to see alternative lifestyles, check out colorful Metalkova City just to experience the vibe. While the Ljubljana accommodation does have the perfect kitchen, you may want to try some of the fantastic restaurants in the city. We’d recommend Kavarna Sem for coffee, sandwiches and snacks, Kantina MSUM for a bowl of very warming soup if the weather’s chilly or try the cevapcici at Das ist Valter. For a beer and pizza, you really can’t beat the Utrip-bar. You won’t go hungry in Ljubljana! If you’d like to spend time in Ljubljana, get in touch! Prices are for 2 persons per night. For an additional adult please add €20 per night, for a child between 4 and 12 years of age please add €10 per night. Children under 4 stay free of charge. City tax is not included in the prices. Minimum stay for Njegoševa Apartment is 3 nights. A shorter stay is possible at a surcharge. 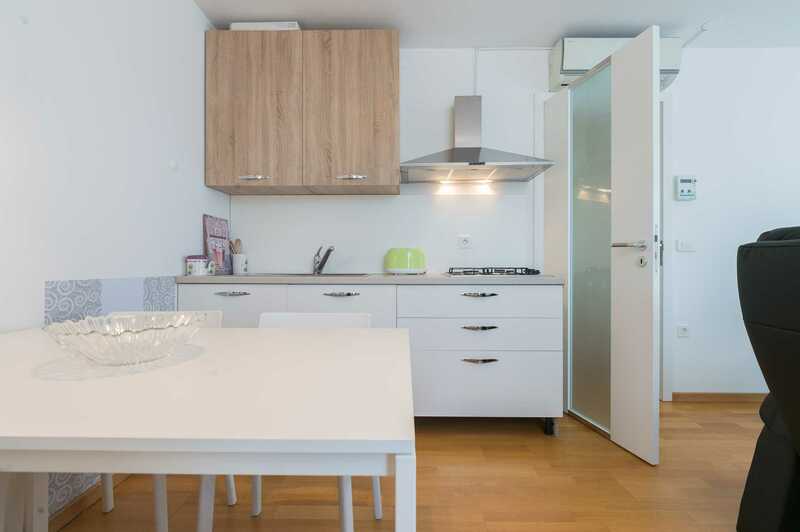 If you wish to book Njegoševa Ljubljana apartment or need additional information, please send us a note. We will reply without delay. 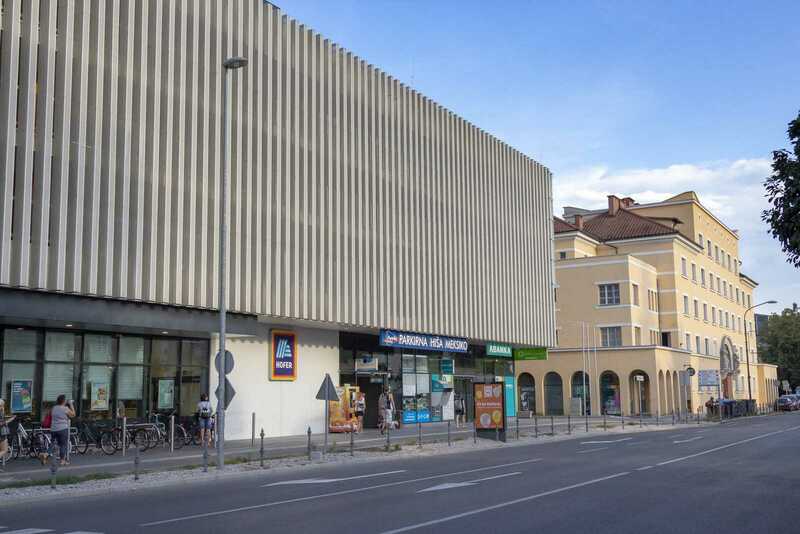 If Njegoševa Ljubljana apartment is not available we will do our best to find and recommend to you a comparable apartment in Ljubljana city center. Great. The WiFi connection was really good. 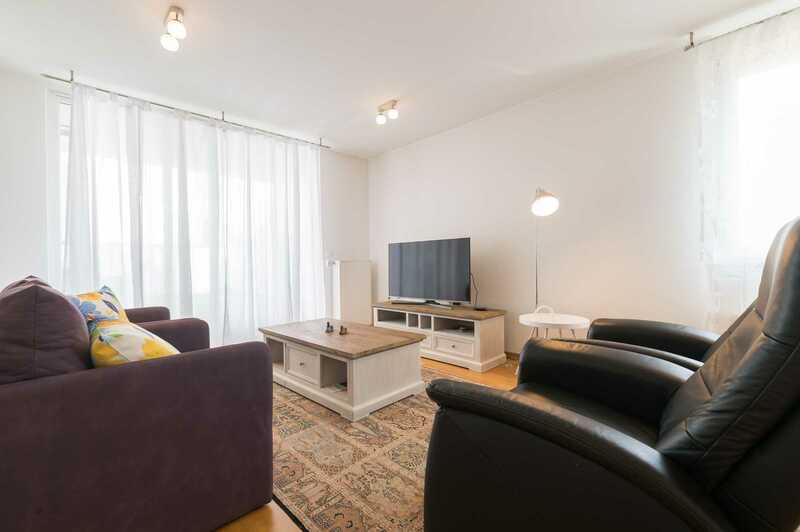 It’s not far from the city center, the apartment is clean, with everything you could need during your stay. It has private underground parking, which is also a big plus since we were traveling by car. 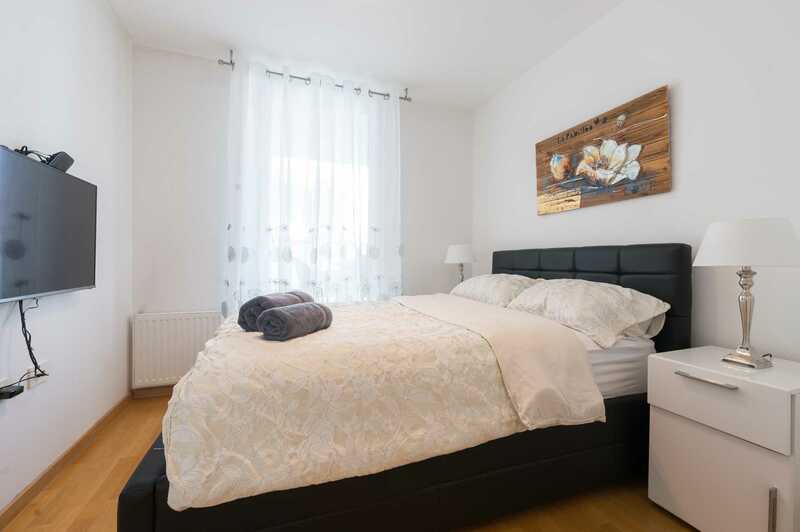 This is a nice apartment, very close to the city center – 15 minutes on foot. There is a large terrace outside, too. Being able to get the keys before the specified time helped us greatly as we arrived early in the morning by bus. The large terrace with the beautiful weather was amazing and so were the different pieces of equipment in the kitchen and in the bathroom. 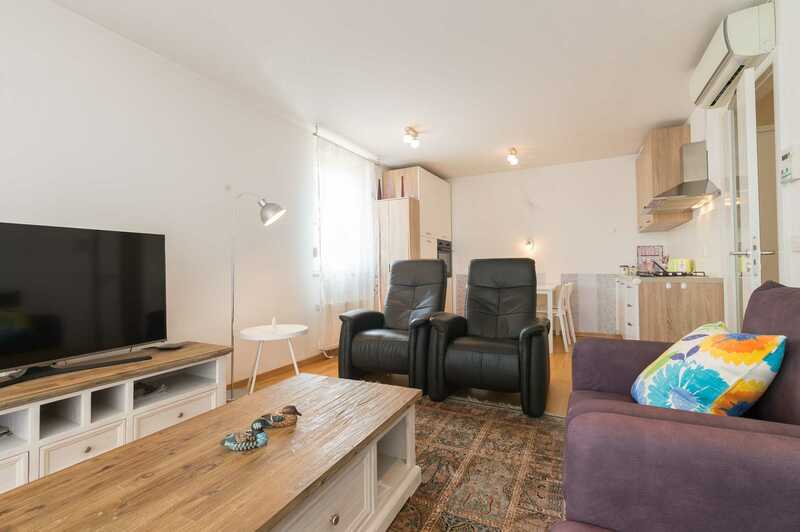 This place is simply great if you are looking for an apartment close to the old town of Ljubljana. 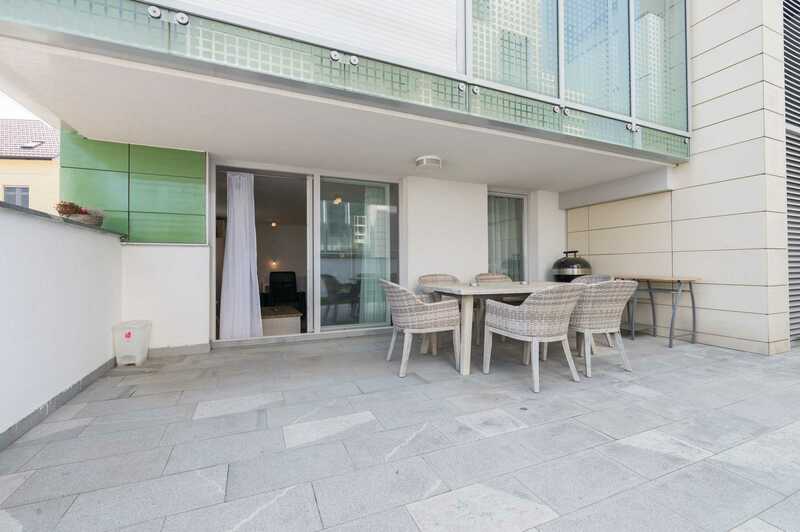 It’s very stylish, super clean and the huge terrace with a BBQ makes it tough for you to want to leave the house. A beautiful, well-equipped apartment. The girl who did our check-in was also very kind. 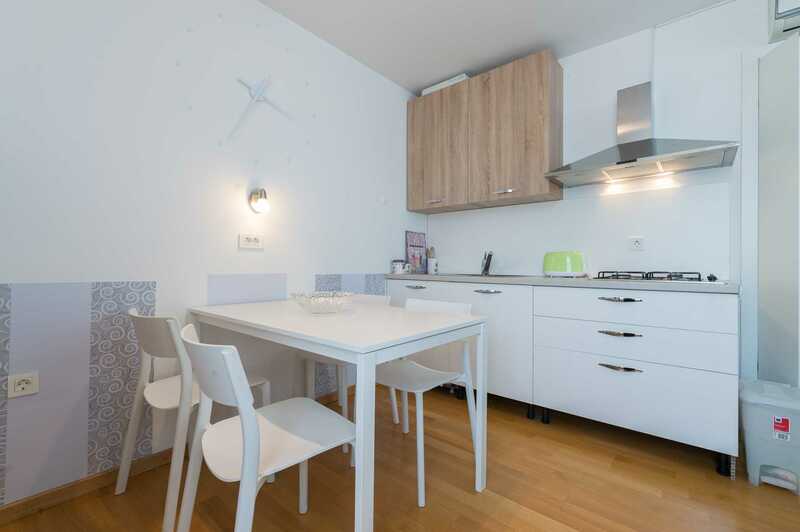 We had an amazing time at this beautiful apartment in Ljubljana! The apartment was safe, clean and located around everything you may need. The owners worked around our schedule for the check-in and check-out, which was very helpful. The hosts were responsive, flexible with my check-out time and available for any questions I had. This pleasant apartment has everything you need, it’s is in a safe neighborhood and it also has a parking garage! I would recommend it! 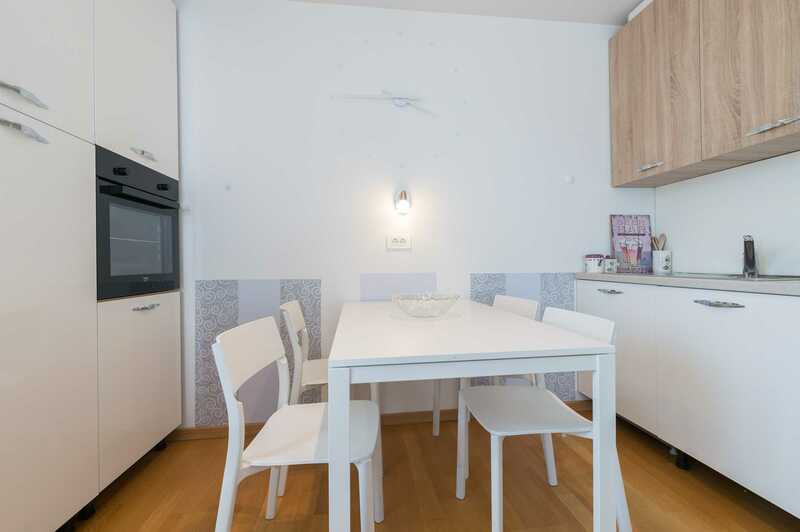 Check out this fine FLA apartment: One Bedroom Apartment Ljubljana Njegoseva – Apartments for Rent in Ljubljana.